So it finally happened – I’ve had my first RSA in 9 years. And what an experience. Suffice to say that I ended that week with no voice, a bad back, and minimally functioning knees, but given the premise of the show I’d peg is as a huge success. First – having BSides to catch up with friends and colleagues was a perfect beginning to the week (not to mention the weekend in Napa right before – thanks for having me, Tenable!). There still is a huge value that I see in BSides, and BSidesSF specifically. Albeit the great venue (thanks OpenDNS), some more hallway-con was sorely missed. Be it the way the venue is laid out (preventing from more active/vocal discussions from happening other than outside), or the decision to run a dry venue (not even bring your own alcohol), I’d want to see how peer-engagement gets more focus there. Last (and I saved the downer for here) – the show floor. After getting over the sheer size of the convention (no worries – BlackHat has a way to go until it becomes an RSA), I had my expectations adjusted a bit. Walking through the halls, you get into a realization that a lot of the companies showing there (especially the south hall) should probably have no reason to exist. The same regurgitation of “threat intelligence”, “endpoint protection” (i.e. APT, 0day, etc…), and your usual “trust me, I’m an engineer” approaches, were becoming comical to a point where I’d need to keep my gaze pointed far away and ignore the noise while walking around. I truly expected to see some new innovative approaches to security, and companies who would break out of the circle-jerk of security vendors. Unfortunately I didn’t see many, the reason for which I can’t really put my finger on (maybe the cost of entry to RSA?). 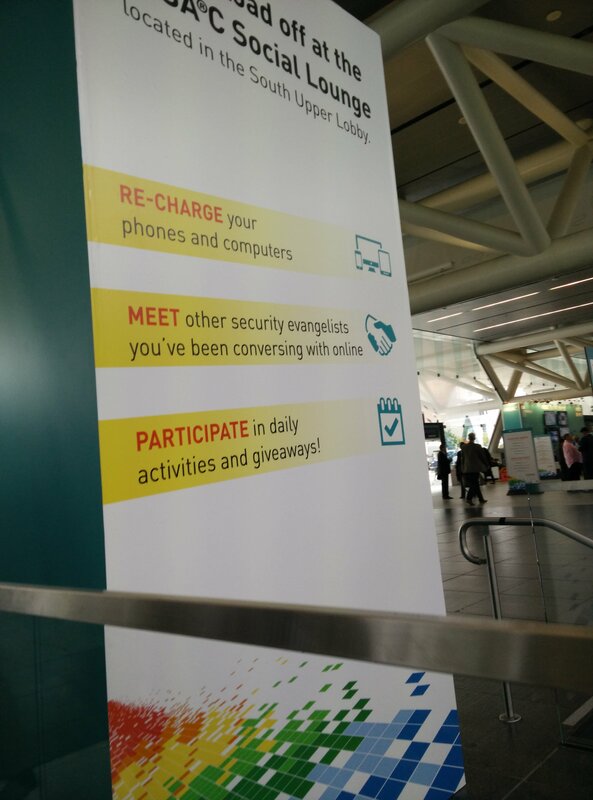 Yes – you can engage with other evangelists at RSA! (and what seemed like a weird obsession – collect truckloads of branded t-shirts and vendor giveaways).